OUR COLLEAGUES AT HOBBY BOUNTIES in Singapore ran a kit competition recently, to commemorate a recent visit by the Royal Air Force Red Arrows aerobatic team. 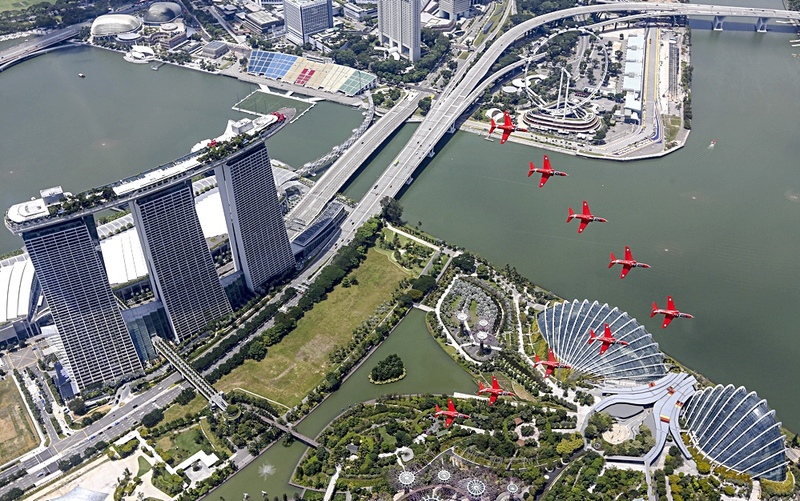 SMN report: The RAF Red Arrows did a flypast over Singapore (header pic) on October 18, 2016, and Peter Chiang of Hobby Bounties organised an Airfix Red Arrows Competition, the winners being announced on October 29. The participants (below) who entered the Red Arrows model aircraft competition. Organiser Peter Chiang is at the far left of the group. Clement Choo (below right) came in Third place, with his Airfix 1:48 scale Folland Gnat, the aircraft that was used by the Reds before the current Hawk. Henry Low (below right) took Second Prize with two Airfix 1:72 scale Red Arrow BAE Hawks, presented on a customised stand. Asrudin Bin Alias (below right) was the deserving First Prize winner, with a super-glossy finish Airfix 1:72 scale Red Arrows Hawk. Well done all! The next competition for Singapore plastic modellers will go back in time, to the conflict of a century ago, World War I. Competitors will build kits based around the theme of Sopwith Camel vs the Red Baron’s Fokker Triplane, both from Airfix 1:72 scale kits. We’re looking forward to seeing the results, which should be at Chinese New Year, around February 4, 2017. The BAE Hawk is widely modelled, from Corgi diecasts, to plastic kits from Airfix and the 1:48 scale kit from Hobbyboss of China. Airfix also produces the Folland Gnat to 1:48 scale, a usefully larger size for this diminutive aircraft. There's also the even bigger 1:32 Hawk from Revell. Thanks for the heads-up on this, Warren. If you want to go even larger, the 1:6 scale EDF (electric ducted fan) radio-control flying model from Phoenix (below) might be up your runway, even if the landing gear looks rather spindly. Competition photos and information, courtesy Peter Chiang, Hobby Bounties. Red Arrows over Singapore, courtesy UK Ministry of Defence.